Orthodox rabbis in Teaneck (and other holy cities) always warn their congregants to observe the Shabbos dress code during summer. No shorts. No casual look. Only bigday shabbos which means clothing appropriate to shabbos. According to this Internet clothing vendor that includes many styles of t-shirts and the like - imprinted with the legend, "Big Day Shabbos". Because these clothes are specifically designated for Shabbos wear, they most certainly satisfy the most stringent halakhic requirements of the mehadrin min hamehadrin for the Shabbos dress code. Canonist brought our attention to this tug-of-war and we've posted a few comments over there. This mess is bad news for students planning to go to a Yeshiva in Israel and return home to YU with credits. The Ministry will not allow the "laundering" of yeshiva credits into college credits. Here's the story and then the explanation. Israel's Education Ministry still is not accepting degrees from Yeshiva University, despite being ordered to do so a year ago. The Knesset's Education Committee discussed the issue Sunday, joined by the university's president, Richard Joel. The degrees are being rejected due to a bureaucratic loophole that bars giving full credit for a student�s year abroad in an Israeli yeshiva. As a result of the rejection, immigrants with Yeshiva University degrees who take government-paid education jobs receive lower pay, since salaries are based partly on level of education. Limor Livnat, the previous education minister, last year declared that the degrees of graduates who appealed to the ministry must be recognized immediately, but her demand did not change policy. The government evaluation body insisted Sunday that its policy was reasonable. Lawmaker Rabbi Michael Melchior ordered the body to present a viable resolution to the committee within one month. It is clear -- the issue with YU degrees in that it’s a back door way for accrediting Israeli Yeshiva study. Many, many YU boys and girls get full credit for studying one or two years in an Israeli Yeshiva. The Israeli government will never open that pandora’s box. I don’t understand what part of this problem Richard Joel does not comprehend. He said to the Knesset committee, “Should Americans start checking every graduate of Hebrew University before they come and study in the U.S.?” Hebrew U is a university not a yeshiva. RJ is making a rhetorical fool of himself by trying to make this false equation. The Israelis in the Ministry do not want to certify the credits from their yeshivas as if they were from universities! They just won’t do that. EVER! I know the academic establishment in Israel. I've spoken to their leadership many times during my numerous sabbaticals. There is no way they will budge on this matter. When YU stops giving credit for “courses” in yeshivas, the Israeli government will have no problem with YU degrees. Get it? See Canonist for more of the ongoing discussion. Who said that religion can't be profoundly hilarious? Whoever made this video has a deep understanding of theology and popular culture. 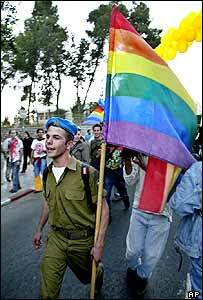 There is a World Pride parade for Gay rights planned for Jerusalem this summer. It was supposed to take place last summer. But due to the fear of violence resulting from the Gaza evacuation it was postponed. There has been an Israeli gay pride parade in Jerusalem for the past 4 years under heavy security and allowed by court order. So this is nothing new to the holy city. What is new is the world wide participation. Jerusalem Orthodox Jewish writer Yaffa Ganz does not like the idea of a gay rights parade in her holy city. Where was she for the past 4 years? Anyhow she has written a gay-bashing opinion that sounds like it could have been penned by any articulate Nazi in 1939. Love, borders & civilization in the Jerusalem Post: LOVE WITHOUT borders? Society is being raped. The underpinnings of human civilization are being whittled away as universal, natural law is being destroyed. The question is - how do the researchers come up with these ideas in the first place? An Israeli hospital has pioneered the use of humor to improve the rate of in-vitro fertilization. Dr. Shevach Friedler of Assaf Harofeh Medical Center in Tzrifin on Tuesday presented findings at a medical conference in Prague suggesting that efforts to artificially impregnate a woman are considerably more successful if she is amused. Friedler cited an experiment at Assaf Harofeh's fertility clinic, in which 93 patients were entertained by a clown during their procedure, and the same number were not. Thirty-three women in the first group conceived, compared to only 18 in the second group - a difference of 20 percent to 35 percent, he said. I've had several angry comments and emails from Orthodox bloggers who think I should have mentioned them in my interview in the Jewish Standard. Let me set the record straight. In my brief comments in the paper I had no intention either of promoting Orthodox bloggers, or of giving a statistically balanced sampler of all Jewish blogs. I don't appreciate anyone making assumptions for me about what I should be writing or thinking. Next, I think in general that Orthodox blogging is an oxymoron. (Same for most forms of conservative or reactionary blogging.) Blogs are subversive of authority by definition. They transfer the power of publication and expression to the grassroots and away from the power elite. Blogs are exceedingly democratic media. Orthodox religion depends for its survival on a closed culture controlled by a rigid power elite. So why Orthodox blogs? Some Orthodox bloggers tend to use the medium as a bully pulpit for pseudo-hip sermonizing; some to sell books; some just to promote their own piety. I stop reading these sites when it becomes clear to me what they are after. Yes, there are real bloggers who happen to be Orthodox or who deal with Orthodox issues. They use the medium as it should be used. More power to them. Are End-Days Christian Apocalytics Good for the Jews? If you have, like me, wondered whether those Bible-thumping, end-of-days-awaiting, Israel-loving Christians are after all really good for the Jews, then have I got a book for you! In fact, I haven't read the book yet. But have I got a review of a book for you! In this review you'll find the thesis that mainline Protestants are bad for the Jews. "Moderate Christians are soon-to-be-ex-Christians, which is to say that they are proselyte neo-pagans. Like most pagans, they hate the Jews. The collapse of the mainline denominations and the corresponding growth of the evangelicals is the best thing that has happened to the Jews in a very long time." 'You don't need to be crazy to be a Zionist, but it helps,' went the Israeli national joke of another era. By the same token, you don't need to be apocalyptic to manage US policy in the Middle East - but it also helps. The importance of Christian eschatology in shaping US attitudes toward Israel disturbs enlightened world opinion, and David Brog's new book will inflame these concerns. At the heart of Christian support for Israel in particular and the Jews in general are Dispensationalists, who support Israel with more passion than do American Jews themselves. Their preoccupation with End Times has entered American popular culture through Tim LaHaye's Left Behind series of bestsellers. Standing with Israel has many virtues, but one big flaw, namely the author's failure to ask, let alone to answer, the obvious question: How is it possible that an idiosyncratic current in non-conforming Christianity, deeply concerned with End Times prophecy and until recently quite obscure, has taken on the decisive role in the great events of the day, as Brog reports? Nonetheless, critics as well as supporters of US Middle East policy will find Brog's report of great use. A Jew and a partisan of Israel, Brog served as chief of staff to US Senator Arlen Specter and staff director of the US Senate Judiciary Committee, with the opportunity to observe the politics of foreign policy at first hand. He leaves no doubt that philo-Semitism is bred in the marrow of evangelical Christianity. America's alliance with Israel stems not from the machinations of powerful Jews, nor from America's imperial ambitions, but rather from an impassioned surge of religious feeling at the grassroots of US politics. Twenty-eight percent of Republicans may be characterized as "religious right", Brog observes, making them "the largest single voting bloc in the party". This is all the more disturbing to enlightened world opinion because End Times prophecy, the Rapture of the faithful, and the Second Coming of Jesus figure prominently in Dispensationalist thinking. There is a bit of mad mysticism about the Christian Right, but the same could be said about the 17th century's master spy and diplomat, the "Gray Eminence" Father Joseph du Tremblay. No one but a mystic could have the stomach for a full-dress religious war, and that is precisely what we have gotten into. Belief in the Rapture followed by seven years of tribulation does not quite qualify as strategic realism, but it might be a more practical guide to foreign policy than, say, belief in the Balance of Power or in the democratization of the Middle East. I do not believe in a coming Rapture, but I do not think it any less likely than the success of democracy in that region. In fact, Apocalyptic inclinations provide a better sort of mental preparation for Middle Eastern politics than the pap dished out by the political scientists. Sadly, there are no solutions to the problems that bedevil the region (Crisis of faith in the Muslim world, November 1, 2005). What Spengler fails to develop is that our American Christians are only partially apocalyptic. (See my theoretical summary.) They buy into the story of the end-times. They relish the conflicts that will hasten its approach. But they do so out of a sense of destiny, not out of a feeling of marginality. That is what sets the Yankee apocalyptic apart from the more common garden varieties. The State of Israel exists, Brog recounts, because a Bible-believing provincial stumbled into the US presidency in 1945. As Brog quotes Harry Truman's adviser Clark Clifford, "He was a student and believer in the Bible since his youth. From his reading of the Old Testament he felt the Jews derived a legitimate historical right to Palestine." Truman overrode the unanimous opinion of his cabinet to cast America's vote behind the founding of the State of Israel in 1947. Appreciative as he may be for the ministrations of Christian Zionists, Brog tries to apologize for their eschatological views. That not only condescends to American evangelicals but, even worse, it betrays a misunderstanding of what inspires Christian passion. Christians identify with Israel precisely because Israel's living history provides the beacons for their own journey to redemption, a journey whose end implies the change in the foundations of the Earth. Prophecy does not concern me, but I know something about shaky foundations. Not only chance, but also Providence favors the prepared mind. I'm not quite sure of Brog's account of Truman's apocalyptic religious motives or of the unanimity of the opposition in his cabinet. But it's worth considering his thesis and Spengler's elucidation thereof. Israellycool reports that a Ghanian player waved the Israeli flag after their World Cup victory. Reuters: Ghana's Sulley Ali Muntari (C) celebrates after scoring his team's second goal against the Czech Republic with team mates as Ghana's John Painstil (R) holds an Israeli flag during their Group E World Cup 2006 soccer match in Cologne June 17, 2006. Painstil plays for Israeli club Hapoel Tel Aviv. I'm interviewed for the cover story of this week's The Jewish Standard - Cover Story: "The blogosphere: A reader's guide". As usual, they put out a great issue -- this week with three features on the Jewish blogosphere: my interview, and articles by Rachel Silverman and Sue Fishkoff from the JTA. I paid $35 to fill up my little car's gas tank on Route 4 this morning. I am just so totally sick and tired of the oil companies picking my pocket week-after-week. Aren't you? So I went to refresh my knowledge of OPEC to the OPEC web site. Lo and behold it gives a clear and unabashed description of the cartel's functions, history, management and other activities. First let's just consider a bit of history. The Organization of the Petroleum Exporting Countries (OPEC) is a permanent, intergovernmental Organization, created at the Baghdad Conference on September 10-14, 1960, by Iran, Iraq, Kuwait, Saudi Arabia and Venezuela. The five Founding Members were later joined by eight other Members: Qatar (1961); Indonesia (1962); Socialist Peoples Libyan Arab Jamahiriya (1962); United Arab Emirates (1967); Algeria (1969); Nigeria (1971); Ecuador (1973-1992) and Gabon (1975-1994). OPEC had its headquarters in Geneva, Switzerland, in the first five years of its existence. This was moved to Vienna, Austria, on September 1, 1965. A fourth pricing crisis was averted at the beginning of the decade, on the outbreak of hostilities in the Middle East, when a sudden steep rise in prices on panic-stricken markets was moderated by output increases from OPEC Members. Prices then remained relatively stable until 1998, when there was a collapse, in the wake of the economic downturn in South-East Asia. Collective action by OPEC and some leading non-OPEC producers brought about a recovery. As the decade ended, there was a spate of mega-mergers among the major international oil companies in an industry that was experiencing major technological advances. For most of the 1990s, the ongoing international climate change negotiations threatened heavy decreases in future oil demand. Somehow this mission of greed got modified somewhat over the years. There was so much money floating around the OPEC states that even these greedy parties had to make some token donations to give the appearance of altruism. OK then, what did they do? In March the organization announced in a press release: "OPEC Fund extends US$2.5 million grant for urgent housing project in Palestine." Apparently OPEC is greedy, OPEC is charitable and OPEC also creates its own diplomatic realities. Their March press release says, "The OPEC Fund for International Development today approved a grant of US$2.5 million to co-finance Phase II of an urgent housing project in Gaza, Palestine. The project, a joint initiative of the OPEC Fund and the Arab Fund for Social and Economic Development (Arab Fund), along with the Palestinian Housing Council (PHC), aims to respond to the critical housing needs brought on by the destruction and damage of thousands of homes in the West Bank and Gaza Strip." We know there is no State of Palestine. OPEC does not know this? I cannot claim to be surprised by the OPEC support of the Palestinians. But anyhow. Feh. This cartel of thieves disgusts me. Sen. Liberman Facing Nuclear Blog? Thanks to Dailykos for catching this one. Where Was the Mystery Mikva House Explosion? Flatlands, Midwood or East Flatbush? Doesn't anyone know in which neighborhood this mystery mikva explosion house is? 1 - Fumes Explode in Brooklyn, Killing Worker and Injuring 2 - New York Times: "The blast ripped through the kitchen floor of the three-story home on East 31st Street in Flatlands just seconds after a resident, Tzipora Friedman, walked out of the kitchen into the living room to look at fabric samples with a decorator who had come to the house, according to a cousin who spoke to Ms. Friedman yesterday. Her husband, Joseph Friedman, and their six children were not home." 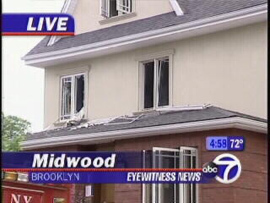 3 - wcbstv.com - Explosion In East Flatbush Home: Channel 2 says it was in E. Flatbush. World Cup fever hits the Jews of Europe. What to do? How about an exhibit? A photo from the upcoming exhibit, `Kickers, Fighters and Legends -- Jews in German Soccer,´ to be shown in Berlin. JTA NEWS: “Kick it Like Kissinger” — yes, former German schoolboy Henry Kissinger — is an exhibit with two venues: the Frankfurt Jewish Museum and the Jewish Museum of Franken, in Furth — the city where President Nixon’s Jewish secretary of state grew up. It will run in both places through September. Is Howard Jonas looking for a bundle of money or is he serious? Net2Phone Sues Skype for Patent Infringement - Yahoo! News: "Some industry observers are saying the suit might simply be a matter of sour grapes. Net2Phone is credited as being a pioneer of the VoIP movement, but has far fewer users than Skype does. " India Times -- SHIMLA: The Israeli government has decided to break up the party. Alarmed at increasing drug use amongst its youth, Tel Aviv has sent rabbis (Jewish preachers) to old Manali, Kasol and McLeodganj in Himachal Pradesh, Rishikesh in Uttaranchal, Pushkar in Rajasthan and Goa spots that attract Israeli youths due to easy availability of drugs, especially hashish. Police sources told TOI these rabbis are trying to bring Israelis who have gone 'astray' back into the mainstream. They have opened Chabad houses (kind of religious centres) in hired rooms for group discussions, religious counselling and one-to-one discourses to make them good citizens once again. Most Israeli youth come to India right after finishing their compulsory army training, which gives them a reasonable amount of money. And, Manali is their favoured haunt because of great weather, cheap hotels and above all, the good quality hashish grown in the region. Sources said of the roughly 25,000 foreigners visiting Manali every year, over 5,000 are from Israel alone. An overwhelming majority of them are on their 'post-army trip' youngsters out to have a good time, which generally means smoking quality hashish. It is said more joints are passed around in Manali hotels than cigarettes. Israelis in Manali generally move in their own quasi hippy groups, dancing to trance music in wild rave parties. Over the years, many have vanished in the hills here leaving behind their passports and expired visas and peddling drugs for a living. Quite a large number of them move to warmer areas like Rishikesh, Pushkar and Goa during the winters. Sources said in all these important destinations, there are two to three rabbis sent by the Israeli government. They are all members of a registered organisation and have opened Chabad houses where meetings are held every Friday and Saturday. The discussion in these get-togethers are mainly on drugs and other vices. There's religious counselling as well. These meetings are open strictly for Israelis only. Even they can't visit these Chabad houses which are decorated with religious pictures, pamphlets, literature and other items of worship on any other day. Former Kullu SP A P Singh told TOI though there were many complaints against the Israelis, they weren't into big crime. Generally, Israelis are seen as brash and ones who get into fights with locals over minor issues. This is one of the major reasons why they aren't liked by local businessmen. Thanks to Onegoodmove.org for posting the video. Keith Olbermann took on Bill O'Reilly last week and now KO follows up. It seems Bill tried to justify the Haditha massacre in Iraq by comparing it to the Malmedy massacre in Germany in WWII, where, he claimed, US troops massacred Germans. Joe McCarthy had made similar claims in the 50's. When told that it was the other way around -- that the Germans massacred our GIs -- McCarthy denied that and said it was a Jewish propaganda plot. Bill O has not said anything about Jews... yet. Keith Olbermann does a followup on the Malmedy story. The good news Fox has corrected the transcript to reflect the truth albeit under pressure, but hey it's better to do the right thing even if you have no real choice. There is bad news as well. Bill O'Reilly still hasn't apologized for his outrageous mistake. He has provided an alibi, but no apology. See the video - it's worth it. Countdown with Keith Olbermann and Onegoodmove.org. Here is the story of the Malmedy Massacre Trial. 'The man shouted 'God will save me, if he exists', lowered himself by a rope into the enclosure, took his shoes off and went up to the lions,' the official said. The incident, Sunday evening when the zoo was packed with visitors, was the first of its kind at the attraction. 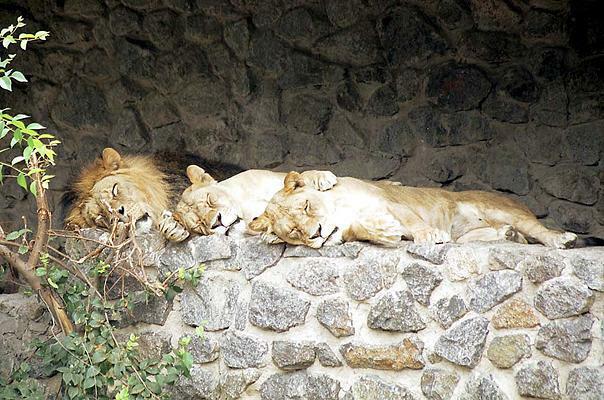 Lions and tigers are kept in an 'animal island' protected by thick concrete blocks. -- And thanks to onegoodmove.org for the heads up on this story. The kosher Italian place, Il Patrizio is no more on 63rd street. Now it is the Haikara Grill -- Japanese and kosher. Mr. Levy attributed Haikara's survival to all the blessings before the meals. 'With a kosher restaurant, you have a lot of praying going on,' he said. 'They say there are 400,000 kosher diners in New York,' Mr. Levy said. " The Times reports on how people use the Internet to bludgeon others into a moral life. This highlights the role the Internet is playing in steering the moral course in our own communities. SHANGHAI, June 2 -- It began with an impassioned, 5,000-word letter on one of the country's most popular Internet bulletin boards from a husband denouncing a college student he suspected of having an affair with his wife. Immediately, hundreds joined in the attack. Within days, the hundreds had grown to thousands, and then tens of thousands, with total strangers forming teams that hunted down the student, hounded him out of his university and caused his family to barricade themselves inside their home.